Earlier this month, the governor released his proposed 2018-19 budget. As a member of the Senate Appropriations Committee, I am participating in hearings to examine the plan and question heads of various state departments, agencies and others receiving tax dollars. This fourth budget plan appears to be the least confrontational submitted by Gov. Wolf, so there is reason to hope an agreement can be reached by the constitutional deadline and avoid the disruption of previous years. His budget includes some warmed over tax and revenue-raising proposals that failed to attract support in the past, so the overall spending is probably set too high. He has picked areas of common priority, such as education, training, and workforce development, to recommend substantial funding increases. But the money will not accomplish as much as it should without corresponding changes in policy and program operation. There are more than a few places in state government where the big problem is not an insufficiency of funds; rather the manner in which the money is used has not kept pace with changes in the economy and our communities and family circumstances. There are clearly areas of common ground, such as the aggressive steps to combat the opioid crisis devastating families and communities in every part of the Commonwealth. It is unfortunate that the governor has continued the tradition of zeroing out programs in agriculture and health care that have proved their value to communities and residents over the years. Part of our budget effort will be directed toward restoring these funds. To watch budget hearings live, or recordings of them, to read summaries of those hearings and to learn more about the budget, click here. To watch the questions I asked and responses I received during these hearings, click here. Join me for a tour of the 102nd Pennsylvania Farm Show in Harrisburg for “Veterans, Military and Their Families” Day and learn more about programs aimed at benefiting military members during a conversation with state Adjutant General Anthony Carrelli. Senator John Yudichak and I recently hosted a roundtable on lead exposure, lead testing, and lead abatement policies in Pennsylvania. The discussion featured Luzerne County Head Start, Maternal and Family Health Services, Early Intervention Services for Luzerne and Wyoming Counties, and St. Luke’s Hospital – Miners Campus. Last October, the Senate created a statewide Senate Lead Task Force and Advisory Committee on Lead Exposure in Pennsylvania under the direction of the Joint State Government Commission. 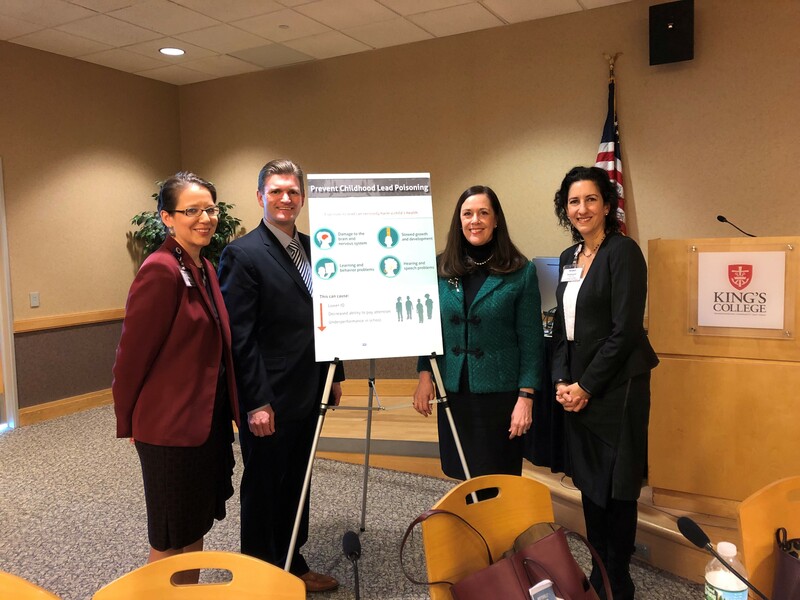 Representing organizations that provide direct health and educational services to thousands of children in northeastern Pennsylvania, the roundtable participants added valuable input on newly proposed legislation that would require universal lead testing for children and expectant mothers. Although a lot of work has been done to determine and document the serious health effects of lead exposure, it too often remains a hidden threat. The effects are especially devastating in the development of children. There is much to be done in terms of alerting people to the dangers, identifying sources of lead contamination, and paying for removing and eliminating the risks. Applications for the Property Tax/Rent Rebate Program are now available at my district offices in Dallas and Hawley. The forms are also available online by clicking here or by calling toll-free (888) 222-9190 or at Area Agency on Aging, fellow legislators’ and Department of Revenue offices. The program, which provides rebates of rent and property taxes paid in 2017, is open to state residents age 65 or older; widows and widowers age 50 or older; and, 100 percent disabled people 18 or older. The income limit is $35,000 a year for homeowners and $15,000 annually for renters, with half of Social Security income excluded. Applicants must apply yearly. The filing deadline is June 30.